Hylomar M is a highly engineered, polyester-urethane based non-setting and non-hardening gasketing compound. The compound is resistant to a wide range of fluids including industrial fuels, oils, water and brine, air, turbine and piston engine combustion products, water, water/glycol and methanol mixtures, petroleum and synthetic diester lubricating oils, gasoline and kerosene fluids (Avtur and Avcat) and fluorocarbon refrigerants. Hylomar M can operate at temperatures between –500C (-580F) and up to 2500C (4820F). 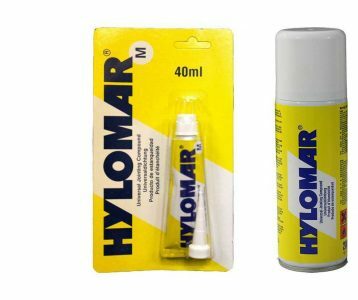 Hylomar M can be used to seal both joint surfaces and threaded parts. Hylomar M Aerosol is primarily for fine coating of traditional gaskets and components. The product has all of the advantages of Hylomar M but is considerably more convenient to apply. "The original and genuine non-setting gasket and jointing compound specified by OEM’s around the world." Hylomar M Jointing Compound will be added to Cart!